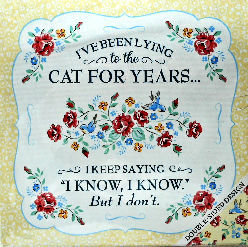 This hand and tea towel says: I've been lying to the cat for years...I keep saying "I know, I know.' But I don't. This towel is 14" wide x 28" high. Designed in England. Image appears on the front and back of the towel. Towel still in its original cellophane wrapper. New.